Back to the scrubbies. On Thursday opened I a new shop in town. A Netherlands bargain shop which also has yarn in – for this price – good quality. Especially their tweed yarn, a sturdy blend of wool and acrylic is lovely and I have used it in several projects e.g. the big miette. They now have two more varieties one in mustard (I did not bought it, but dream about it) and a pink/coral version which I posted on Thursday. But that’s not all. 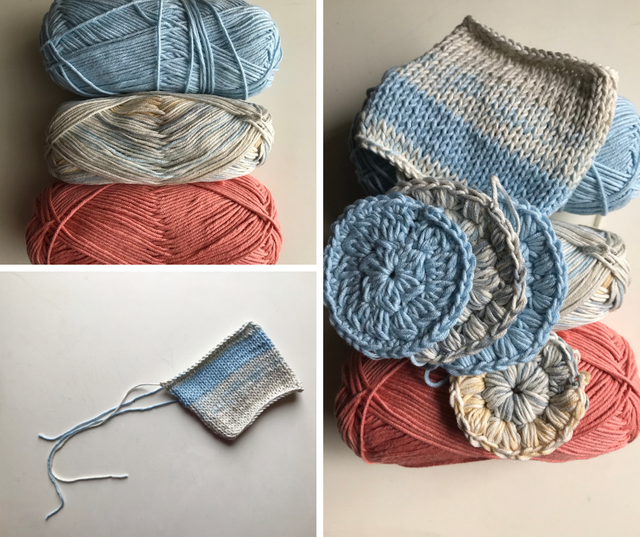 As a opening surprise they introduced a new yarn blend, a mix of cotton and acrylic in three variegated versions and three matching solid colored ones. And this yarn is soooooo soft!!!!! What a luck, a washable yarn in powder colors perfect for the reusable make-up cleaners. I bought two skeins and got one for free and directly started to work on the scrubbies. I used a 5 mm hook and this pattern as a guideline. Some of the pads I made bigger with three rows of puff stitches and some with only two rows. I tried once to finish the scrubby with a single crochet row, but I did not like the finish and ripped it out. 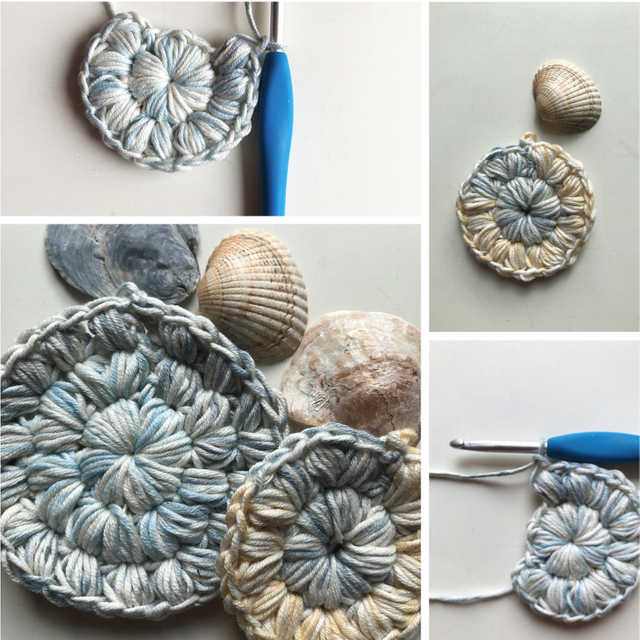 While crocheting happily away I thought this will make a nice present for my make-up using friends and while pondering this, I also notice how long I need for all these puff stitches. As a lazy person clever strategist I wanted to try out a faster pattern with less yarn overs. So I used a cluster stitch instead of the puff. Meh… not so cool. 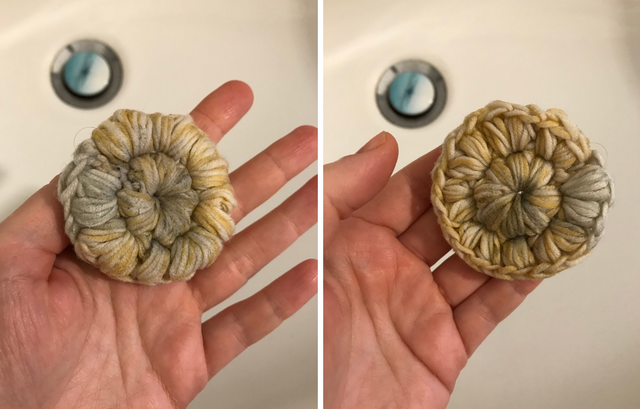 I think this scrubby would work ok for removing things from your skin, but it is not as soft and cushion like as the puff stitch variety. 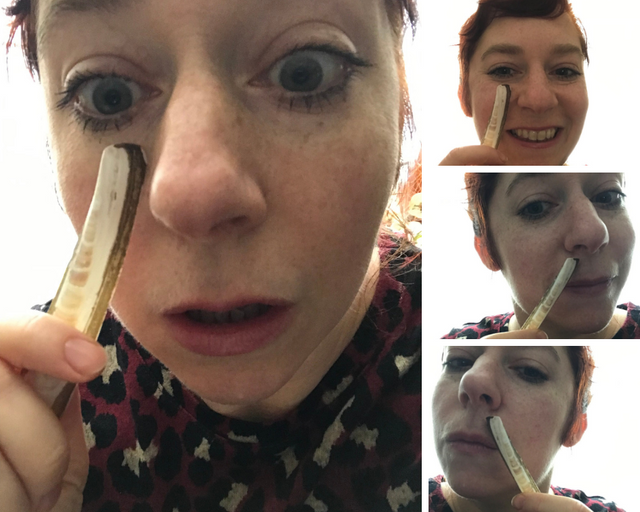 I would not recommend it for your eyes. I am not happy. Do you see all the grayish stains? 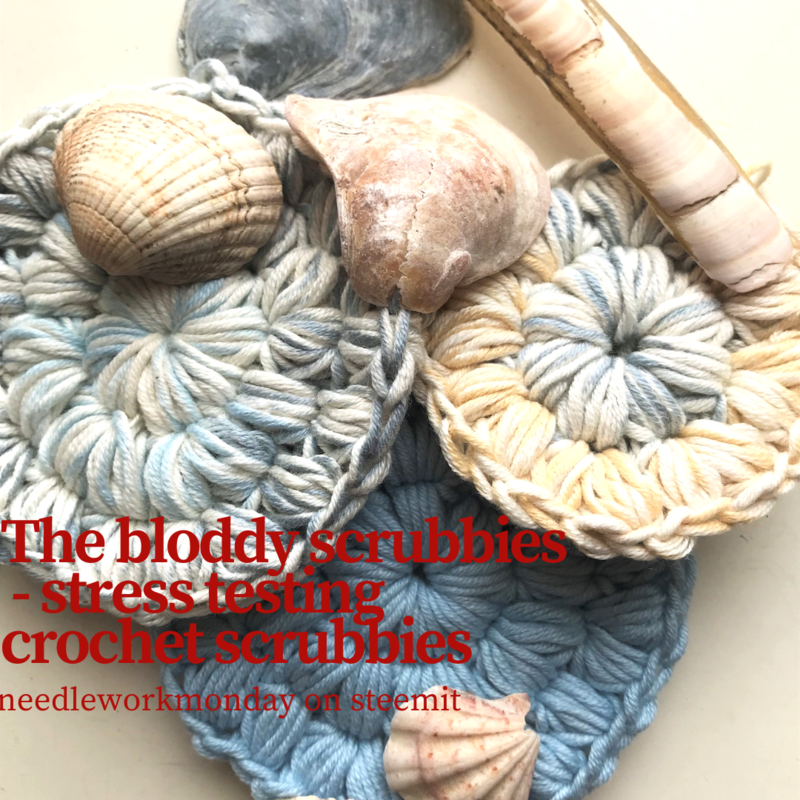 This cute shell colored puff stitch scrubby is still dirty. I am disappointed… sigh. 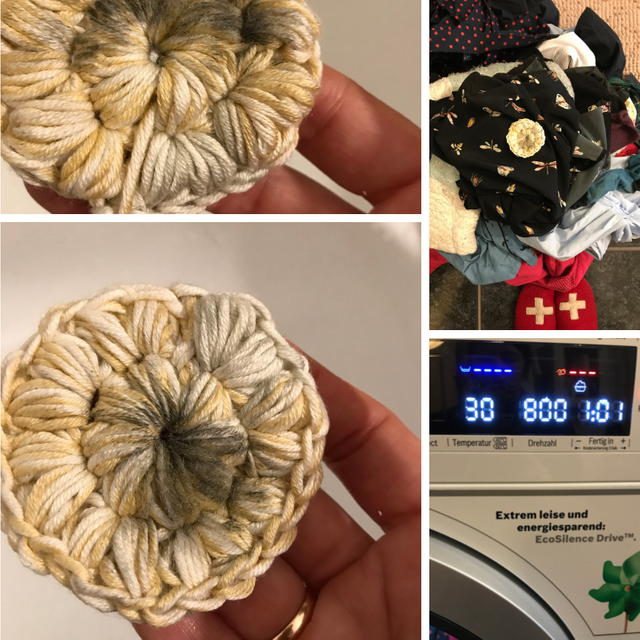 I will give these pads another chance to get clean in a 60 C° washing program (and perhaps shrink, as the manufacturer recommends washing their yarn not exceeding 30 C°). I hope I can tell you something more encouraging next week. 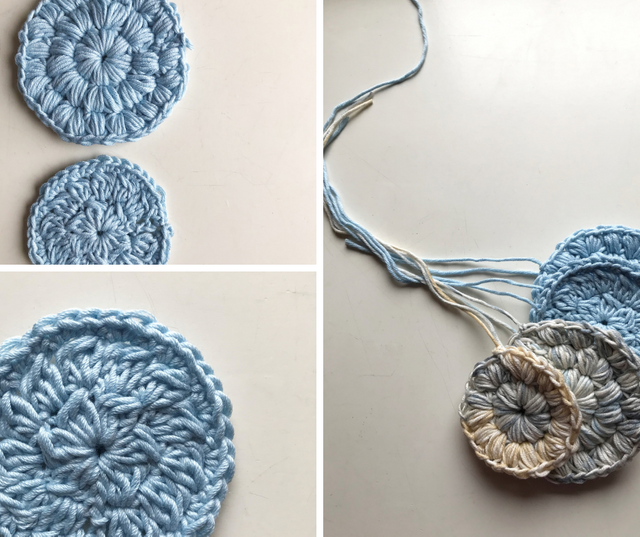 If you anyhow want to crochet these little pads as they also make wonderful hanging ornaments you can follow @cryptocariad‘s explanations in English or @grizzabella‘s post in German and English.